Tummy tuck is a procedure to remove the excess sagging abdominal skin along with tightening of the abdominal wall muscles to restore the tone. During a tummy tuck, excess skin and fat are removed from the abdomen. In most cases, the connective tissues in the abdomen are tightened with sutures as well. The remaining skin is then repositioned to create a more toned look. Abdominoplasty also tightens the muscles that have been separated and weakened by pregnancy giving patient more youthful appearance, strength and confidence. The procedure may somewhat improve the appearance of stretch marks, especially those located below the navel (typically seen following pregnancy). This surgery can take anywhere from one to five hours. You may need to stay overnight in the hospital, depending on your case. You will get general anesthesia, which will put you to “sleep” during the operation. Subcutaneous (beneath the skin – about 80% of all body fat), This Subcutaneous fat is removed by Liposuction. During this procedure, a number of small incisions are made, and the entire surgery is performed using long, thin instruments. The surgeon will tighten the abdominal muscles and may remove excess fat, but will not remove any excess skin. As such, this surgery is best suited for patients who have bulging bellies, but little excess abdominal skin. 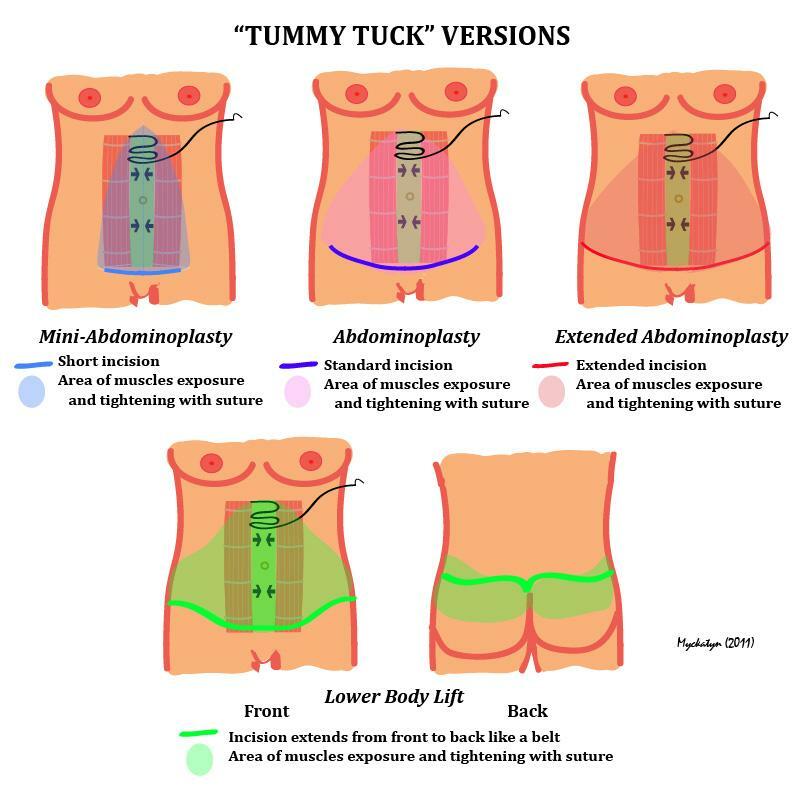 A mini tummy tuck, or partial tummy tuck, is more invasive than an endoscopic tummy tuck, but still less than other forms of tummy tuck. It is frequently recommended for patients who are within 10% of their ideal body weight because it is less traumatic, but is somewhat less versatile than a standard tummy tuck. This tummy tuck technique only requires one incision, which lies low across the abdomen and is not as wide as a full tummy tuck. In this procedure, the navel is left intact and does not need to be recreated. Depending on the patient’s needs, the surgeon may use liposuction techniques to remove fat from under the belly button, and some muscles between the navel and the pubis may be tightened. Patient’s abdomen will be cut from hipbone to hipbone in this procedure, the option for those patients who require the most correction. The incision will be made low, at about the same level as patient’s pubic hair. Surgeon will then manipulate and contour the skin, tissue and muscle as needed. Patient’s belly button will have a new opening if he/she undergoes this procedure, because it’s necessary to free navel from surrounding tissue. Drainage tubes may be placed under skin and these will be removed in a few days as surgeon sees fit. This procedure is recommended for patients who have excess skin and fat located around the love handle and hip areas. This surgery is performed in a similar manner as a traditional tummy tucks, but it treats a larger portion of the abdomen. 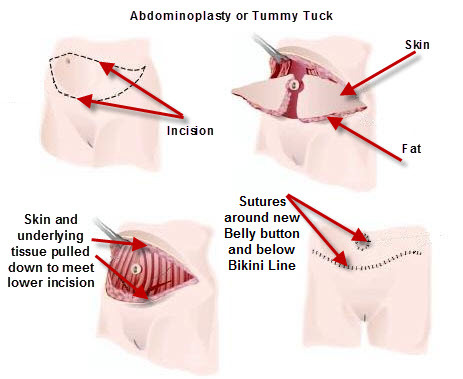 In this tummy tuck technique, the incision is much larger: in addition to stretching across the patient’s lower abdomen, it reaches all the way to the back of the patient’s hips. Women – generally around the buttocks and thighs: “pear-shaped”. Men – generally around the abdomen: “apple-shaped”. Note that these are the predominant patterns – but both ‘apple’ and ‘pear’ shaped distribution can be found in either gender. Estrogen (female hormone) increase fat storage in the body. Estrogen cause fat to be stored in the buttock , thighs and hips in women, when women reach menopause and the estrogen produced by the ovaries declines, fat migrates from their buttocks ,hips and thighs to their waists ( belly) . Males generally deposit fat around waists and abdomen apple shape due to lack of estrogen. Knee Fat often builds up on the inside region of the knees in most of women. Upper Arm Also common in women, fat build up can occur in the middle to upper area of the upper arm. Abdomen Fat build-up around the navel area is common in both men and women. Love handle or tyres is due to abnormal fat deposition over tummy area. It is also one of the few fat deposits that are also found in slim women. Outer Thigh Sometimes called “Riding Breeches” – this area is the most likely place for the pitted or ‘quilted’ appearance of cellulite. This fat concentration also blends with fat tissue on the inner thigh and the buttocks. Buttocks Without fat here – sitting would be quite uncomfortable. Fat is held in place by the gluteal fold. If significant fat is lost from the buttock, then only appropriate training can prevent the buttock from sagging down against the thigh. There is considerable research showing that fat distribution varies between gender and ethnic groups. For example men have an overall less body fat percentage than woman and Asian adults are more prone to visceral and central obesity than Europeans. Mediterranean women are prone to fat gain in the outer thighs. Significant scarring. If the incision area does not heal properly, there is a chance of poor quality scar. This can often be treated by a second operation. There can be delays in wound healing if you have problems with the blood supply in your skin. Blood clots and infection. As in any surgery, there is a risk of bleeding, infection, blood clots, or reaction to the anesthesia. Recovery will take several weeks. Your doctor can give you medication to reduce the pain. Swelling should begin to disappear in a matter of weeks and resolve completely in a few months. You will have to restrict exercise and other activity as advised by your doctor. Scars are normal, and they will fade over the course of a year. Your plastic surgeon will take care to ensure that the scars will be hidden by bathing suits and clothes. The surgeon may also recommend scar treatments such as laser that help scars fade and soften. How long you maintain your abdominoplasty benefits tends to be limited only by how well you take care of your body following surgery. Best Surgeon for Tummy Tuck? Best Hospital for Tummy Tuck? Second opinion from Expert for Tummy Tuck? Tummy Tuck cost in India? Tummy Tuck procedure in Kochi? Safe and Secure Cosmetic Surgeons for Tummy Tuck? Tummy Tuck success rate in India?